Whether they’re lured in by draft pedigree, untapped potential or one-year wonders, teams overpay free agents every single offseason. Here’s a list of six free agents teams should avoid overpaying for in free agency. Le’Veon Bell is really good at his job. He’s not a free agent to avoid because of his talent; he’s a free agent to avoid because of his asking price. As PFF’s Eric Eager detailed here, running backs are replaceable in today’s NFL and lack value as a result. Bell falls into that category regardless of how successful he was before he sat out the 2018 season. The soon-to-be 27-year-old back wowed us with high grades in his first five years in the league, but his current contract projection (Four years, $60 million, $33 million GTD, per Jason Fitzgerald) is simply too high given his positional value. 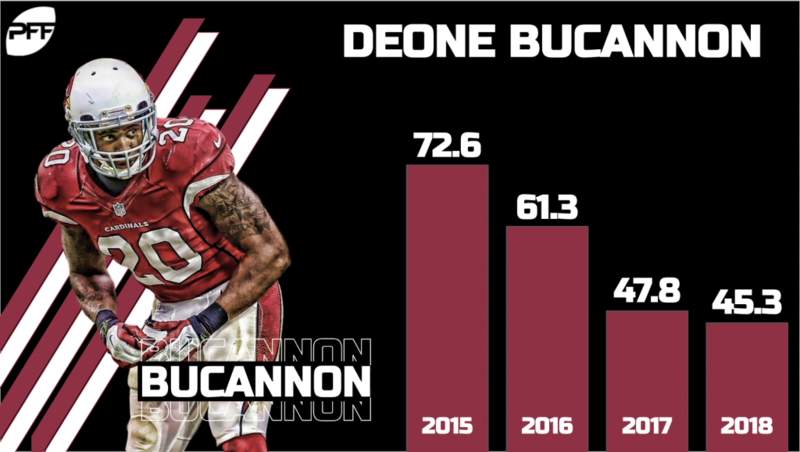 Arizona Cardinals’ Deone Bucannon had a career year playing his hybrid linebacker/safety role in 2015, giving reason to believe the former Washington State first-rounder could be a difference-maker in the NFL for years to come. That simply hasn’t been the case. Bucannon has failed to come close to his career-high 72.6 overall grade in 2015 in the three seasons following, earning extremely low run-defense and coverage grades in the process. He’s a former first-rounder with a lot of natural ability, but paying him the big bucks in the offseason could prove costly. Fitzgerald also projects that Donovan Smith, a four-year starter at tackle for the Tampa Bay Buccaneers, will get paid well – too well – due in large part to his durability and the current demand-supply ratio of left tackles in the NFL. Though health hasn’t been a concern, Smith’s performance when healthy hasn’t been pretty, as he’s earned sub-65.0 overall grades in each of his four seasons in the NFL. His pass-blocking grades have improved in the last two years, but he’s still allowed 42-plus pressures every year of his career. At just 24 years young, Kwon Alexander could draw the attention of rebuilding franchises looking for a long-term solution at off-ball linebacker. But Alexander’s youth shouldn’t be the driver in that decision, for his play in Tampa Bay hasn’t quite lived up to expectations. While he’s flashed upside as a blitzing linebacker across his limited pass-rush opportunities, Alexander has struggled significantly in other areas. Hamstrung by injury in 2018, Alexander earned just a 59.1 overall grade, and his sub-70.0 overall grades in the three years prior are bogged down by poor tackling and lackluster run defense. Chris Hogan’s three-year tenure with Tom Brady and the New England Patriots was expected to bring out the best in Hogan, but that was never the case. After his 1,012-yard season with the Pats in 2016, Hogan’s production fell off a cliff in the next two seasons. He earned sub-62.0 overall grades in 2017 and 2018, respectively, as a result. Former first-round picks can get a lot of love on the open market for the wrong reasons, and that very well may be the case with Cedric Ogbuehi. The former Texas A&M standout entered the NFL with high-end potential with his 6-foot-5, 308-pound frame, and desirable athleticism. But no Cincinnati Bengals coach has been able to tap into said potential in four years in the league. In the two years Ogbuehi played 600-plus offensive snaps (2016 + 2017), he earned sub-60.0 pass-blocking grades and allowed 78 total pressures between the two seasons.